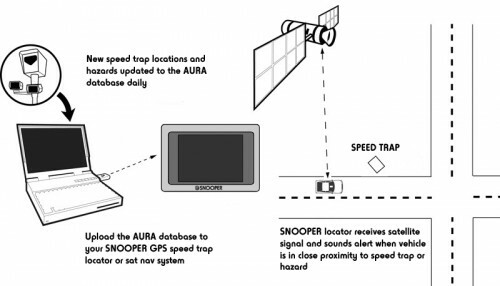 The Snooper speed camera database is used in all Snooper sat nav and speed trap detectors and is called the AURA database. This leading camera database not only includes speed camera and accident blackspot locations in the UK, but it also covers many other countries speed traps around the world too. Included outside of Europe which most other sat nav databases features are the locations to cameras in USA, Canada, Australia and New Zealand. What's more the AURA database is the only database updated every single day. Unlike most other speed camera databases which at best are updated on a weekly basis. Rest assured with more than 30 years experience, a Snooper detector or sat nav using the AURA database will alert you to all the speed cameras along your route. How does the AURA database work? Snooper employs a dedicated professional team to verify the locations of every speed camera and high risk zone in their AURA database. They aim to ensure new speed cameras are within their database within 48 hours. You can then download the AURA database to your device as many times as you like whenever you want to. Once the database is downloaded to a Snooper speed camera detector or Snooper sat nav and when you comewithin proximtiy of a speed camera location in your vehicle, the camera alert device starts to warn you of the location via spoken alerts and beeping tone warnings. At each speed camera location the speed limit is also either displayed and annonced, ensuring you know exactly what the speed limit is for the road where the camera is located.. There is a 'LIVE' version of the AURA database which updates as you drive along the road. This eliminates the need for a computer to update your speed camera database. This feature is only available with the Snooper Lynx GT LIVE. New: The AURA database now includes alerts to the new REDFLEXhadecs3 or HADECS 3 varible speed cameras. Alerts to this new type of speed camera is listed and will display on-screen as a Gatso camera. Speed cameras included in the AURA database are: Gatso, MCS, Truvelo, Truvelo D-Cam, HADECS 3, Watchman, DS2, Speedcurb, average speed cameras, Mobile Laser Sites, Mobile Camera Vans, Mobile Gatso, Accident, Hotspots, High Risk Zones, Digital Cameras, Congestion Charge Cameras and Schools (Optional). How much does the AURA database cost? Whether you are using a dedicated speed camera detector or a sat nav the cost and the detail of the database is exactly the same, which is approximately £30 per year. There are how three speed camera detectors that currently include a FREE Lifetime Subscription to the AURA database. These are the Snooper Pantera, Snooper Lynx GT Lite and Snooper MY SPEED AURA. Thus these systems represent very good value for money. Here at SpeedCamerasUK we sell the latest range of Snooper Sat Nav and speed camera detectors that use the AURA database. If you are looking for a dedicated speed camera detector that uses the AURA database of speed camera locations then you can read more view at our buyers guide which talks you through the various features and different technology the different systems use. We also have dedicated reviews for each product with user comments. To buy a dedicated speed camera detector from SpeedCamerasUK visit our online detector shop. If instead you are looking for a sat nav to get you from A to B with the best speed camera locations that the AURA database provides we also sell a range of sat navs which you can browse via our online Sat Nav shop. The sat navs are tailored for use by drivers of cars, truck drivers or caravanists so you can rest assured you have the best sat nav speed camera warning system. You can also view and read all our different sat nav reviews by clicking here.